How important is managing type 2 diabetes? Poorly controlled cases are associated with a shockingly wide range of life-threatening complications, including blindness, kidney failure, amputations, heart attacks, and dementia. 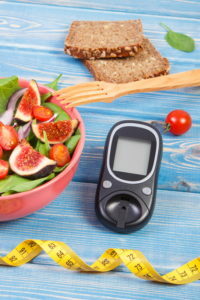 According to a study recently conducted in UK, more than 80,000 people who gave up low-fat, high carbohydrate diets found that after ten weeks their blood-glucose levels dropped. An astonishing 40 percent of U.S. adults will develop diabetes in their lifetime. Type 2 diabetes mellitus is a chronic disease that results primarily from abdominal obesity, which leads to resistance to the hormone insulin. Poorly controlled type 2 diabetes is associated with a shockingly wide range of life-threatening complications, including blindness, kidney failure, amputations, heart attacks, and dementia. Obviously, managing type 2 diabetes is a critical challenge. Diet and lifestyle interventions are the cornerstone of diabetes care. No conventional drug therapies or dietary supplements can overcome the toll that poor diet and lifestyle choices take on diabetes. There are many therapeutic ways of eating that effectively treat diabetes, including vegetarian, vegan, low-carb, Paleo, and low-glycemic-load diets. [4-7] Some of most satiating diabetes eating plans, however, are relatively low in carbohydrates and have a low glycemic load—that is, they don’t spike blood sugar and insulin levels. The SweetLife Diabetes Health Center’s­ low-carb diet, which was created by functional medicine practitioners, limits carbs to 50 to 100 grams per day, or about 15 to 20 percent of daily caloric intake. Fiber has a negligible impact on blood sugar and can be counted as half (6 g of fiber = 3 g of carbs). 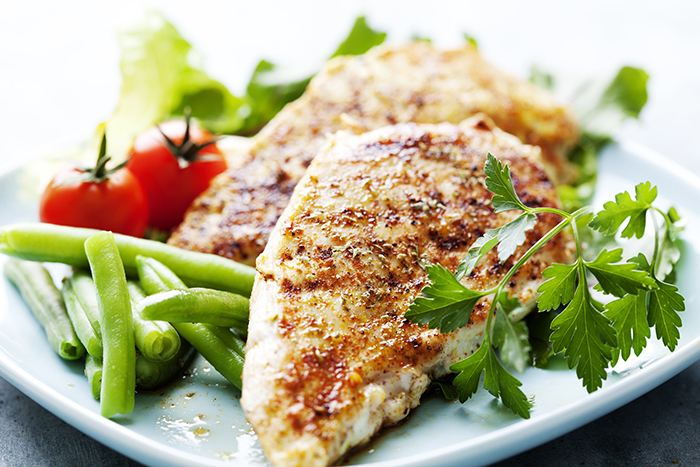 Contrary to popular belief, the best low-carb diets for diabetes are not high in protein. Too much protein is easily converted to sugar and stored as fat, especially in people with insulin resistance. Excess protein also raises insulin levels, which further aggravates insulin resistance. Optimal daily protein intake depends on fitness level and blood sugar control, but should typically account for 15 to 25 percent of daily caloric intake. Fat makes up 55 to 70 percent of daily caloric intake in this type of low-carb diet. Don’t let that scare you. Eating healthy fats will not make you fat if they are not combined with refined carbohydrates or overeating. Unlike protein and carbs, fat has almost no impact on blood sugar and insulin release, and it slows sugar and protein absorption to help regulate blood sugar levels. Focus on monounsaturated fats from olive oil; omega-3 fats from fish, nuts, seeds, and grass-fed meat; and medium-chain fatty acids from coconut oil, which actually stimulates fat burning. Dr. Loren Cordain’s Paleo diet is another effective option. The Paleo diet focuses on lean or grass-fed meats, lots of non-starchy veggies, moderate amounts of healthy fats, and some fresh fruit and starchy roots and tubers. Both these dietary approaches focus on meals cooked from scratch using real, whole, fresh foods. Even conservative medical journals such as the Lancet confirm that the quality of foods is more crucial than is the quantity for type 2 ­diabetes treatment. That means that calories don’t matter as much as what you’re eating. Managing Type 2 Diabetes: Do Supplements Help? It lowers blood sugar levels (fasting glucose, glucose after meals, and average glucose as measured by hemoglobin A1c) just as much as prescription medications. It is as effective as lipid-lowering drugs for decreasing total and LDL cholesterol. It lowers triglycerides and increases HDL cholesterol. It lowers blood pressure better than medication alone. Notably, no serious adverse reactions were reported in the 27 trials. Take 500 to 1,000 mg of berberine HCl twice daily. PGX (or polyglycoplex), taken before meals, lowers blood sugar and insulin, and reduces sugar and fat absorption into the bloodstream, helping to control appetite, weight, blood sugar, and cholesterol. [11,12] When sprinkled on foods, it lowers the glycemic index. Take 5 grams before meals with a glass of water, or sprinkle 5 grams on food before eating. L-carnitine improves insulin sensitivity and cholesterol in type 2 diabetics. It lowers fasting glucose levels by an average of 14 mg/dl and LDL cholesterol by 9 mg/dl in people with type 2 diabetes. In people with non-alcoholic fatty liver disease, which is very common in diabetics, L-carnitine plus diet reduces blood sugar and lipids and improves insulin sensitivity, inflammatory biomarkers, and liver structure and function more than diet alone.16 It’s also been shown to lower blood pressure in addition to treating blood sugar and insulin regulation in people at high risk for cardiovascular disease. Take 1 gram of acetyl-L-carnitine twice a day. Alpha lipoic acid is a naturally occurring potent antioxidant compound that improves blood sugar and insulin regulation when taken at a dose of 1,200 mg daily. It helps prevent the damage that leads to diabetic peripheral neuropathy, decreases neuropathy pain, and helps prevent it from progressing. [20,21] The supplement also helps improve erectile function in men with type 2 diabetes. Alpha lipoic acid is considered safe and well-tolerated. Take 600 mg alpha lipoic acid twice a day. Fenugreek (Trigonella foenum-graecum) contains compounds that improve glucose tolerance and insulin action and lower inflammation and blood lipids. Take 10 grams of powdered fenugreek seeds per day soaked in hot water or encapsulated, or take 1 to 2 grams a day of a fenugreek seed extract. [26 Smaller doses of fenugreek powder and extract may also be therapeutic when combined with other botanical medicines. Choose an extract that is standardized to contain 25 percent gymnemic acids and take 400 mg twice daily. Lower amounts may also be beneficial if the gymnema is standardized to a higher percentage of gymnemic acids or if it is taken in combination with other botanical medicines, such as fenugreek and bitter melon. To curb sugar cravings by temporarily blocking the ability to perceive sweetness, open a capsule and put a small amount of the powder on your tongue, or place a few drops of gymnema tincture on your tongue. Bitter melon (Momordica charantia) is one of the most popular herbs for treating diabetes in Asia and studies confirming the safety and efficacy of bitter melon fruit juice, powders, and extracts for diabetes treatment are accumulating. Bitter melon juice powder effectively reduced hemoglobin A1c in a recent study, although not as effectively as the drug glyburide. It also had favorable effects on cholesterol, triglycerides, and biomarkers for atherosclerosis, whereas glyburide did not. While no serious side effects during clinical study period have been reported, in some patients, headache, dizziness, stomach pain, and bloating have occurred. Take 2 to 4 grams of bitter melon fruit juice powder per day, in divided doses. Lower doses of bitter melon fruit extracts may also be beneficial, especially when used in combination with other botanical extracts, such as Gymnema and fenugreek. Many high-potency multivitamin and mineral supplements, especially those formulated specifically for those with diabetes, contain therapeutic doses of chromium, biotin, and other key nutrients for proper blood sugar metabolism. They also contain antioxidant vitamins and minerals to help protect the tissues from excess blood sugar and oxidative stress. Regular use of such a multivitamin/mineral formula is recommended. Begin with your food. Choose one of the diets discussed above—a low-carb or Paleo diet—or any other low-glycemic load diet, such as The Blood Sugar Solution diet by functional medicine practitioner Dr. Mark Hyman. What matters most is eating real, whole foods and avoiding refined and processed foods. The best approach is to learn as much as possible about nutrition and cooking, and to remember to take things day by day, meal by meal, continually re-committing to making food choices that support health. A combination formula that contains some of the botanical extracts listed above, such as berberine, fenugreek, gymnema, and bitter melon. The amounts of each ingredient may be different than those recommended here, but such a formula is a good place to start, especially if you are new to supplements or your budget doesn’t allow for more. PGX. Take before meals, as described above. Natural therapies and lifestyle changes are the most powerful ways to treat the root causes of diabetes and achieve safe, lasting results. Working with a practitioner trained in naturopathic, integrative, or functional medicine is highly recommended, especially if you take diabetes medications, since your dose may need to be adjusted to prevent hypoglycemia. (You can find a practitioner in our online directory.) Do not decrease or discontinue any prescription medications unless you’re working in conjunction with your doctor. The latest science shows you can heal from this modern plague. Get started today. 1. U.S. Dept Health Human Serv. CDC. National diabetes fact sheet. 2011. 2. JAMA. 2014 May 7; 311(17): 1778–1786. 3. Clin Interv Aging. 2015; 10: 549–560. 4. Lancet. 2014 Jun 7;383(9933):1999-2007. 5. Am J Clin Nutr. 2013 Mar;97(3):505-16. 6. Diabetes Metab Res Rev. 2014 Mar;30 Suppl 1:24-33. 7. PLoS One. 2014 Jul 9;9(7):e100652. 8. Cardiovasc Diabetol. 2009 Jul 16;8:35. 9. Nutr J. 2013 Jul 29;12:105. 10. J Ethnopharmacol. 2015 Feb 23;161:69-81. 12. Diabetes Care. 2000 Jan;23(1):9-14. 13. Nutr J. 2010 Nov 22;9:58. 14. Arch Med Sci. 2014 May 12; 10(2): 336–344. 15. Exp Clin Endocrinol Diabetes. 2013 Apr;121(4):234-8. 16. Am J Gastroenterol. 2010;105:1338–45. 18. Arch Med Sci. 2014 May 12; 10(2): 336–344. 19. Asia Pac J Clin Nutr. 2012;21(1):12-21. 21. Int J Endocrinol. 2012;2012:456279. 22. Folia Med (Plovdiv). 2013 Jan-Mar;55(1):55-63. 23. Diabetes Care. 2011 Sep;34(9):2054-60. 24. Adv Nutr. 2015 Mar 13;6(2):189-197. 25. Int J Vitam Nutr Res. 2009 Jan;79(1):34-9. 26. J Assoc Physicians India. 2001 Nov;49:1057-61. 27. J Sci Food Agric. 2014 Mar 30;94(5):834-40. 28. J Ethnopharmacol. 1990 Oct;30(3):295-300. 29. Phytother Res. 2010 Sep;24(9):1370-6. 30. Diabet in Control Newsltr. 2001 Oct 30;76. 31. Nutr J. 2015 Jan 26;14(1):13. 32. J Lipids. 2015; 2015: 496169. 33. J Am Board Fam Med. 2009;22(5):507-512. 34. Diabet Med. 2010 Oct;27(10):1159-67. 35. J Clin Pharm Ther. 2014 Jun;39(3):292-306. 36. Diabetes Metab Res Rev. 2008 Jan-Feb;24(1):41-51. 37. Endocr Metab Immune Disord Drug Targets. 2015;15(1):54-63. 38. Adv Food Nutr Res. 2014;71:55-100. 39. PLoS One. 2014 Jun 24;9(6):e100379. 2 diabetes, add, aging, alpha lipoic acid, antioxidant, antioxidant vitamins, appetite, atherosclerosis, b12, biotin, bloating, blood glucose levels, blood pressure, blood sugar, blood sugar control, blood sugar levels, calories, cardiovascular, cardiovascular disease, carnitine, cholesterol, coconut oil, cooking, dairy, dementia, diabetes, diabetes care, diabetes control, diabetes drugs, diabetes fact sheet, diabetes medications, diabetes mellitus, diabetes treatment, diabetic, diabetic peripheral neuropathy, diabetics, diastolic blood pressure, diet, dietary supplements, dizziness, erectile, erectile function, exercise, fatty liver, fenugreek, fiber, fitness, food, glucose, glucose levels, Glycemic index, glycemic load, glycemic load diet, gymnema, gymnema sylvestre, hdl, hdl cholesterol, headache dizziness, health, healthy fats, heart attacks, herbs for, hormone, hypertension, inflammation, insulin, insulin resistance, integrative, kidney failure, ldl, ldl cholesterol, liver disease, low carb diet, low glycemic load diet, lower blood pressure, metabolism, metformin, most popular herbs, natural therapies, natural treatments, natural treatments for, naturopathic, nutrients, nutrition, nuts, obesity, omega 3, omega 3 fats, overeating, oxidative stress, pain, paleo diet, Pancreas, processed foods, protein, refined carbohydrates, side effects, stomach pain, stress, sugar, sugar levels, supplement, supplements, the glycemic index, to lower blood pressure, Triglycerides, type 2 diabetes, type 2 diabetes diet, vegetarian, vitamin, vitamin b12, vitamins, vitamins and minerals.